With my first conscious thought this morning I pondered a long-forgotten question: What shall I do today? I have had little occasion to ask myself that question in the 23 years since I entered corporate life and then began building my family. I rolled the thought around my mind, tasting the deliciousness of the possibilities. Never mind that the actual play by play of my day reads like a rather mundane "to do" list. The very fact that I decide what makes the list and when I start and stop each task caused me to jump out of bed with a smile. My youngest started kindergarten this week, darting off to the bus with a nervous grin and eyes sparkling with excitement. 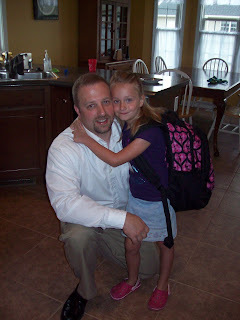 She gently but firmly informed us that she did not want us to accompany her to her class on the first day of school. So we took pictures before waving her off, and I returned to the quiet of an empty house. I love my children, truly I do. And I love my husband. I also love my time alone. I feel a bit of a kinship with my father this week. I believe he began planning for his retirement from the time he walked off the stage with his doctoral degree in hand. He enjoyed his careers, as far as I could tell, the teaching and speaking, anyway, if not the administrivia. But he had plans for that time when he determined the answer to his own "what shall I do today" question. Now here he is, living in a wonderful log house in a village in the mountains, teaching himself Greek and Hebrew, hiking and biking, volunteering, and (I hope) writing. I have no aspirations to teach myself Greek and Hebrew. I do, however, have a book patiently waiting for me to write it and a blog suffering atrophy from my shameful neglect. I have Old Testament lessons to prepare for early morning seminary and muscles begging for regular exercise. I may even treat myself to a little non-required reading now and again. We all have our guilty pleasures, after all. In the short term, when yet another person cheerfully asks what I plan to do with my newfound freedom, I will simply smile and say, "Soap operas and bonbons, of course."